Mumbai, 19 March 2015: The fantabulous trio of designers Shovit Dasgupta, Durba Nag and Sharan Kaur, stayed true to their roots while showcasing their collection for their label ‘NOTLIKEYOU’ at Jabong Stage during Lakmé Fashion Week Summer/ Resort 2015. Their designs were about the wonder that is India. Something about the rawness of hand woven fabrics drew them to venture into the aesthetics of this widely practised but undermined form of art. The idea was to promote the beauty and create a new hopeful future for this art. Unusual but unique, the cuts were fun and new like the revival of a 25-year-old sari turned into a cropped top and dirndl skirt set. Each fabric used was painstakingly handmade down to the last inch like the pure Khadi fabrics of Bengal. Jamdani weaves, hand painted and wood block prints were some of the elements that stood out. An ensemble that was particularly striking was the parrot green tunic, with pleated detailing with a lighter shade of green shawl-draped around the neck. Another lively piece was the pink tented tunic with a wide green border. A healthy reminder of talent in the very potential of this craft was the ideology behind Shovit Dasgupta’s, Durba Nag’s and Sharan Kaur’s label ‘NOTLIKEYOU’ and certainly achieved it. 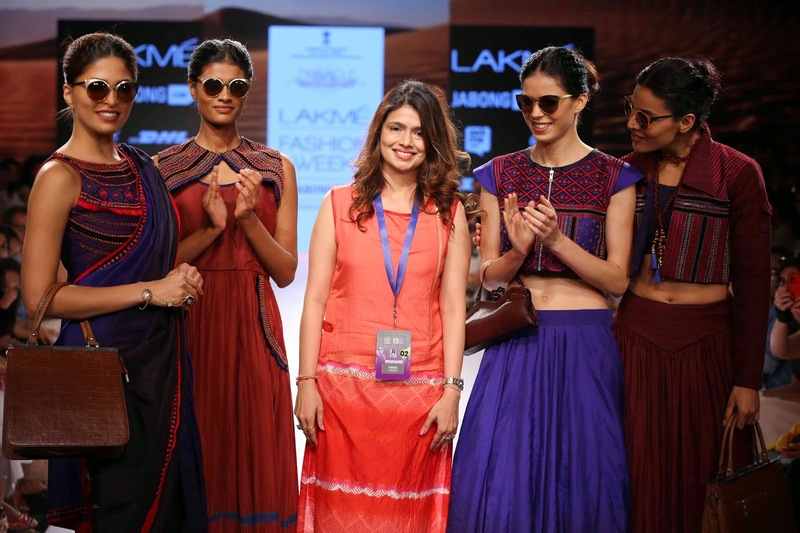 VASUNDHARA MANTRI EMBODIED A FAMOUS AVATAR AT LAKMÉ FASHION WEEK SUMMER / RESORT 2015. ‘Yagyaseni’ was another name for Draupadi, the heroic princess who was firm with a stone hard will, in the Hindu epic ‘The Mahabharata’. Draupadi grew into her own person after emerging through hardships, pains and trials in life. Delving into the moral of the story, the collection told a tale of every women overcoming hurdle after hurdle to find herself in the process. Using jute as a main component for her designs, Vasundhara judiciously incorporated it along with sheer fabrics to create a stunning fusion between the two. Colours of jute like beige and mud brown were used in jibe with translucent blacks, pearl whites and dull greys. An element of the apparel that was enrapturing was the Cleopatra-like, front-open jute dress adorned with golden accessories and the black cropped corset amalgamated with a sheer maxi skirt with alternate panels in jute and a beaded gold cape. The compilation used statement-making jewels that emphasized the power of women, and incorporated it into metal and pearl meshes used in various styles. The collection comprised jewelled caps, body and leg-chains, mesh gloves, hand harness, cuffs, earrings, jewelled veils and waist backbone. Fashion at its best, ‘Yagyaseni’ by Vasundhra Mantri was an eye opener for all the ladies to recognize their self-worth, and want to be fashionable in doing so. 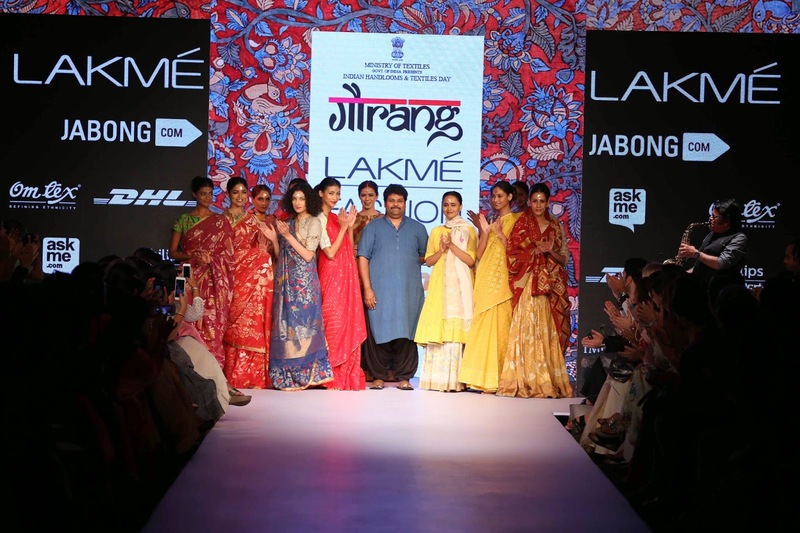 19 March, 2015: With two timeless fabrics as their base, Mayank Anand and Shraddha Nigam presented their “Chauraha” collection at Lakmé Fashion Week Summer/Resort 2015. Dhonekali from West Bengal was a fabric with its unusual twisted yarn that is normally found in the pallav. The Gamcha, the other selection was a very interesting unstitched fabric/garment of the country with multiple uses, which is carried by men and women throughout the year for different purposes. The designing duo used them in a colour palette of black, white and red checked pattern along with hand woven cotton that created a fashionable stir on the runway as the models glided down. From interesting draped tunics and dresses to cowl pants and striking tops; the collection made optimum use of these two very humble textiles. Construction was at its extreme best. 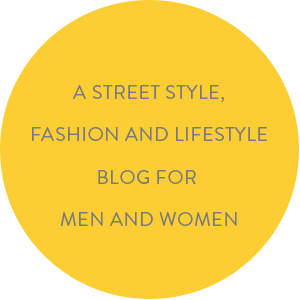 Starting with an attached necklace to a multi panel dress, the looped tunic, a great buttoned down onesie with a detached collar and jumpsuit tunic. The extended kurta maxi dress with attached dupatta, Jaffa pants, shirt-jacket dress, a shift with an attached cape and a lop sided top were some more eye- catchers. The designing duo did not control their creativity as the asymmetrical kurta with shoulder drape and the layered maxi completed the cool but very rustic collection. When fashion followers want to dwell deep into rustic culture and bring popular fabrics into their wardrobes, the “Chauraha” collection by Mayank Anand and Shraddha Nigam will satisfy their sartorial needs. 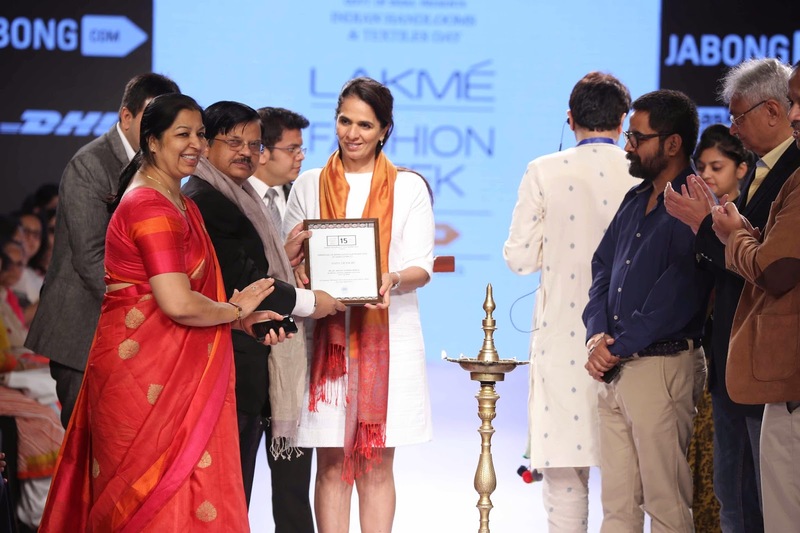 Aimed at the jet-setting global traveller who believes in sustainable fashion, Divya ensured that her fabric choice was pure hand spun and woven Khadi, organic silk and silk chiffon, which were given an innovative touch with traditional reinvented Kalamkari and Ajrakh in natural dyes. To make life really easy for the worldwide tourist, there were summer trench coats with spacious pockets for Ipad, mobiles and passports. For the sporty ones, the addition of convenient pockets for binoculars so that hands were kept free was great. With the ‘trench’ as the inspiration, the collection added trench anarkalis, which would be ideal for that destination wedding far away from home. Colours were kept very earthy with beige, brown, leaf green and rust adding to the natural tone of the collection. Detailing that was impressive were the slit sleeves, floppy collars, tail coat tunics, beautiful cutwork sleeves and hem edges, the very interesting dhoti skirts and batwing covers. Added to the look was eco-wood and silver jewellery decorated with kachchi embroidery. Mix fashion with an organic flavour and turn into a “Sultana on Safari” declared Divya Sheth with her colourful collection. 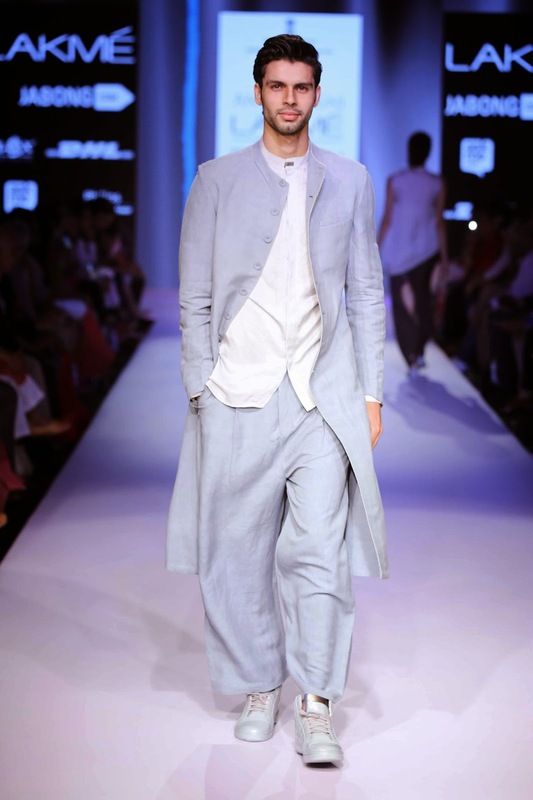 ‘Antar-Agni’ the label by Ujjawal Dubey offered innovations for his men’s and women’s wear collection called “Half-Light” at Lakmé Fashion Week Summer/Resort 2015. Ujjawal aimed to create a fashionable balance between contrasts, played with dark and light grey as well as pastel shades of blue and then sprang a surprise with metallic colour details. 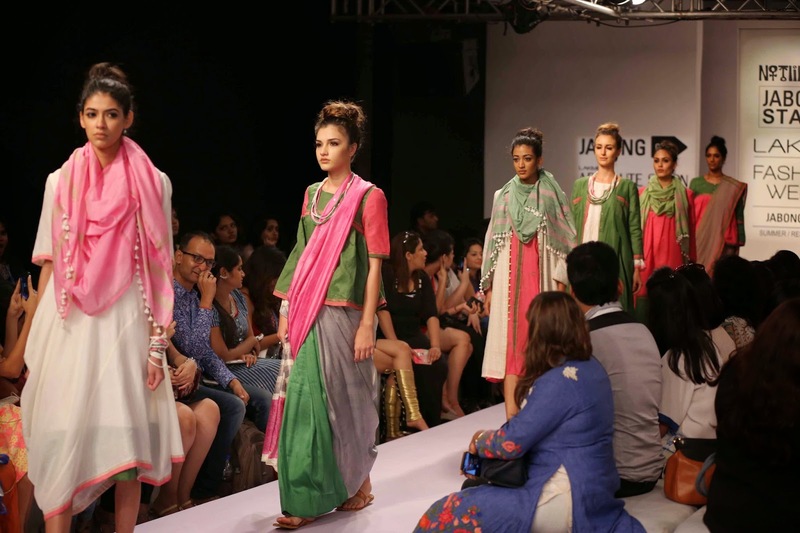 Keeping the silhouettes to relaxed fits, which were oversized and layered, Ujjawal’s fabric options were restricted to handwoven khadi, linen net, linen satin blends, cotton linen and added faux leather and organza for accents. Detailing gave the men’s wear a New Age feel as wide salwars, one- button collarless jackets, long knee length Sherwani, and cross-over kurta revealed some comfy options. Angular and asymmetric hemlines accentuated the kurta; while the bundgala jacket with an uneven midi kurta was an unconventional semi-formal offering. The five women’s wear looks started with a relaxed panelled anarkali with an organza inset at the sides, moved to a cross-over top worn with slashed and layered pants, a cowl draped toga top and a very innovative pant/skirt. The final kurta with a draped attached dupatta was an amazing two-in-one style. When men and women want subtle drama or a hint of raw glamour in their wardrobe then they should head for Ujjawal Dubey’s “Half-Light” collection created for his ‘Antar-Agni’ label. 19 March 2015, Mumbai: This season it was the divine tree in Hindu mythology that inspired Gaurang Shah’s collection called “Kalpavriksha” at Lakmé Fashion Week Summer/Resort 2015. 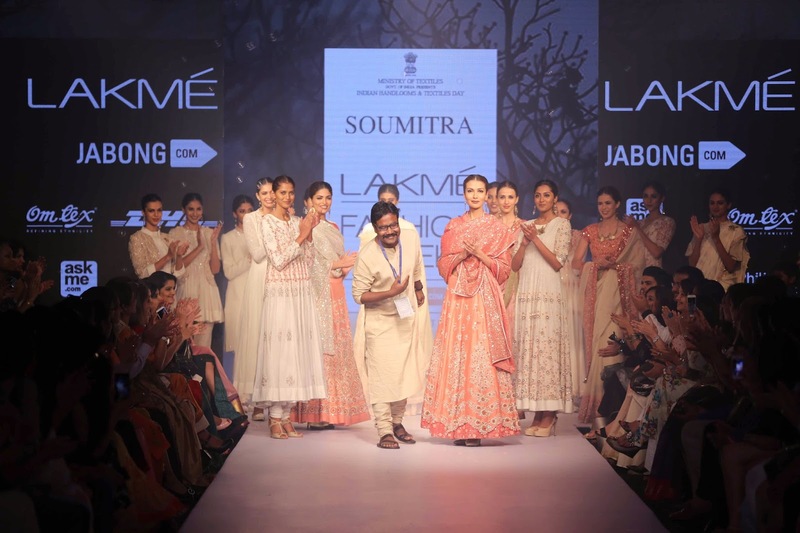 Gaurang winner of many awards for his work with Indian textiles and khadi, once again revisited the humble ‘fabric of freedom’ with a representation of the ‘Tree of Life’ woven by the Jamdani weavers of Andhra Pradesh and Bangladesh. He creatively merged the khadi with Phulkari, Kalamkari and Chikankari to bring an innovative textile offering. The glamorous show began to the live strains of melodious music by well known saxophone player, Anil Kumar, who serenaded the models with popular Bollywood tunes. Presenting the exquisite Jamdani art, where the discontinuous extra weft technique of weaving by hand is with a detailed hand drawn design kept under the warp on the loom and replicated perfectly; Gaurang ensured that the result was flawless. Creating a perfectly balanced melodious fashion jugalbandi, Gaurang brought together Jamdani, Phulkari, Chikankari and Kalamkari and offered heirloom pieces. Stunning anarkalis with intricate weaves, ghagras that were voluminous but superbly crafted and elegant saris worn by graceful models floated down the ramp. Colours from rainbows were used for the weaves and designs, as indigo kurta with woven border, flared beige anarkali, rust lehenga with leaf design, a black stunning sari with a bird pattern, and lots of florals recreated the natural theme. Phulkari was used for dupattas and cholis, while a bird and tiger weave looked magnificent on a sari. Making a surprise appearance on the ramp from the audience was showstopper Bollywood super star, Vidhya Balan. She looked beautiful in a gorgeous pink/gold sari designed by Gaurang Shah as they glided down the catwalk together to thunderous applause. When women want timeless innovative classics in their wardrobe then the beautiful “Kalpavriksha” collection by Gaurang Shah will win them compliments galore. 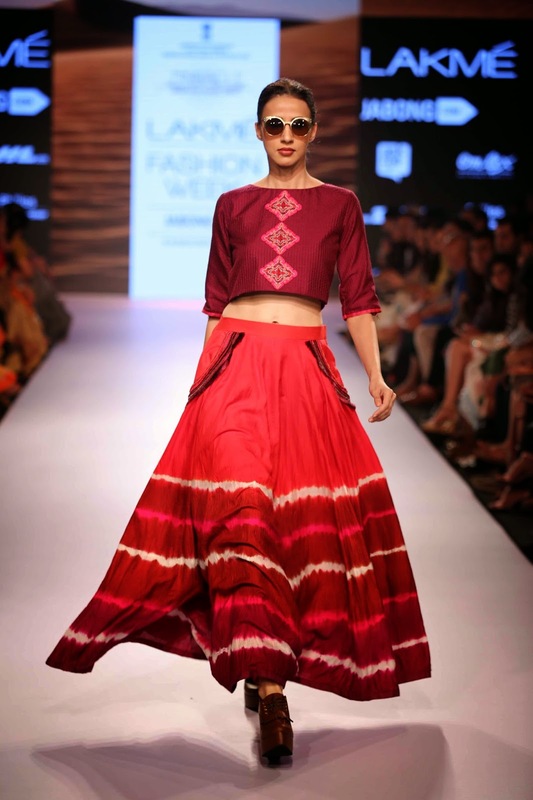 Dedicating her “Nomadistaan” collection to the new breed of globe trotters, Shruti Sancheti created a perfect blend of textiles and crafts at Lakmé Fashion Week Summer/Resort 2015. Keeping the focus on non-conformist lines, Shruti opted for rich hues that ranged from the popular Marsala, soft peach, blush, tangerine, to vibrant crimson red, rose, pink, burnt orange, yellow, indigo, ochré, blue and olive. The fabric base remained organic as pure woven khadi, eri, matka and summer silk came together with organic cotton to form the soul of the collection. Prints played an exciting role as Shruti brought together a mélange of tie and dye, Shibori, leheriya, mothda, resist dyeing with wax and block prints. The detailing was intricate with heer, Bhagat embroidery, kaleen or carpel embellishments and the fabulous banjara work seen in the artistic Thar region but now given a modern slant. Giving mix and match options to the dresser, Shruti displayed a relaxed layered look that started with maxis, midis, floppy pants, jumpsuits, pleated pants, tail coat jackets, swishy long or spliced skirts and completed the line with saris. Detailing appeared in the form of assorted pockets on sleeves that added to the fun-filled quirky nature of the collection. Zippers gave skirts and tunics a glitzy detailed touch, when they appeared in pairs down the front of slashed kurtas. Shorts were seen with side slit long tunics, a tiny shrug added to beauty of a brown maxi and the black and blue shaded sari and choli revealed contemporary flavour. For striking rustic inspired vibrant clothes, the young and those young at heart need not travel far since “Nomadistaan” by Shruti Sancheti is within easy reach. For Lakmé Fashion Week Summer/Resort 2015 one of Kolkata’s top designers, Soumitra Mondal for his label ‘Marg’ presented a contemporary royal line, called “English Garden”, which was seamlessly blended with classic Indian heritage. The designer focused on embroidery and developed some interesting and eye-catching embellishments in varying patterns. 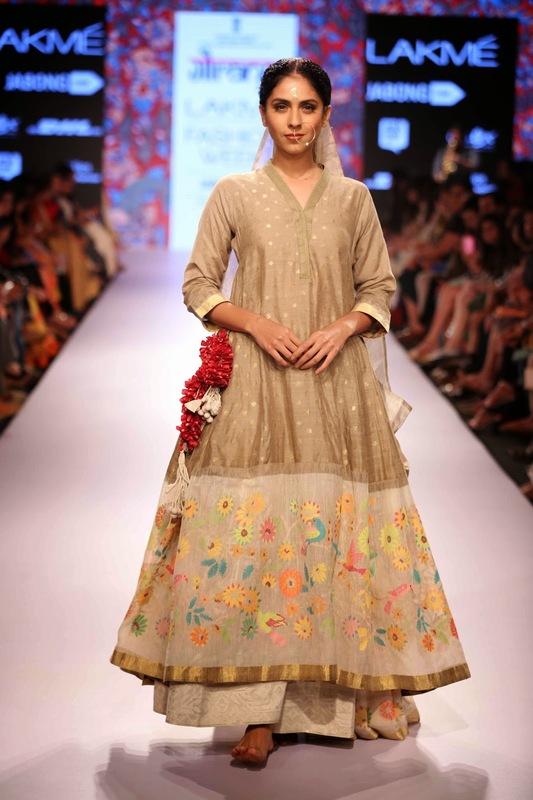 Inspired by the beauty of nature Soumitra had florals in varying shapes and sizes to embellish the creations. Staying true to his love for khadi, a fabric Soumitra has promoted religiously year after year, this time it was woven in 200’s count along with silk, cotton silk and zori khadi all with a clever twist in the weaving process. The colours were dramatic with white and pitch, balanced perfectly by gold and silver. 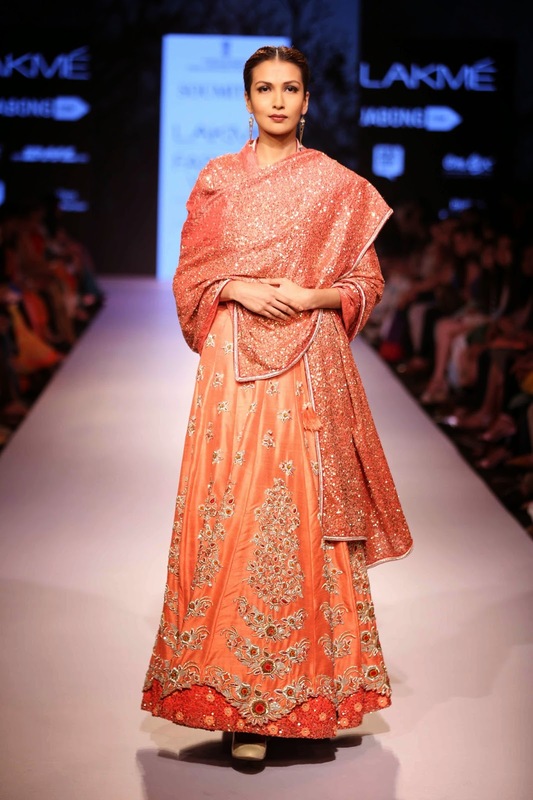 The silhouettes were very traditional as swirling anarkalis, stylish Bandgalas, smart blouses, voluminous lehengas, regal jackets, cute boleros, fitted dress with slim pants and glamorous saris with gold embroidered borders took centre stage. 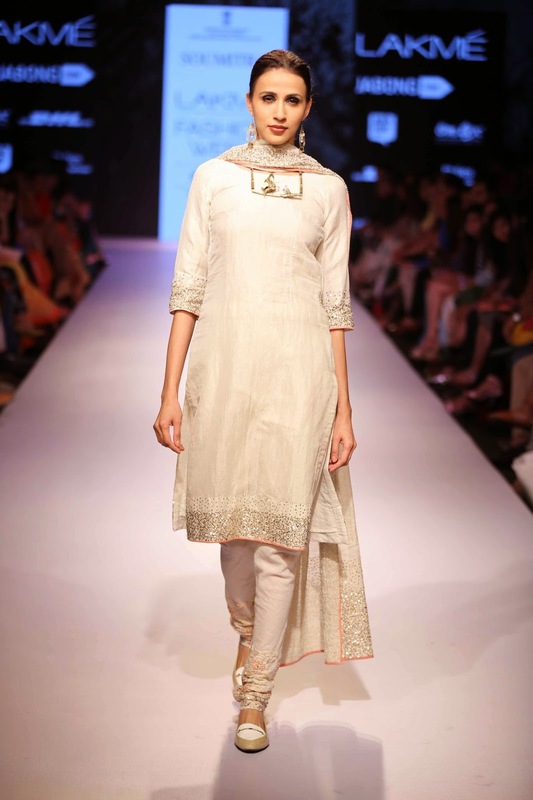 Mini kurtas appeared with embellished waist coats and slim pants; while a regal white Sherwani was a sophisticated entry. White was the favoured colour of the collection but with large doses of embroidery that ranged from sequins to crystals and even 3D work. The final striking entries featured lehengas with intricate pearl work, cholis with dazzling embellishments and dupattas that matched the beauty of the two. The beautiful handcrafted jewellery in butterfly shapes for the neck and ears and as brooches was a perfect complement to the collection. When tradition and New Age innovations are blended creatively, then Soumitra Mondal’s collection, “The English Garden” for his ‘Marg’ label is at the top of the fashion ladder.